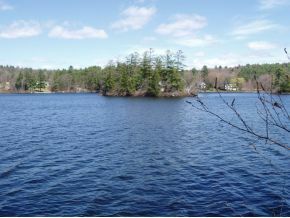 Lake Winona located in New Hampton NH is 154 acres and minutes to Meredith and Exit 23 or 24 off Interstate 93. 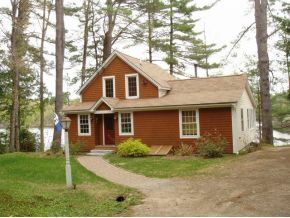 This charming year round home located on the shores of glacial Lake Winona, one of NH's best kept secrets. Great fishing"¦fish from your deck which is cantilevered over the crystal clean water. 16' boat dock. This home was built in 1938 but remodeled in 1988 , more recently in 2003 and is in excellent condition.. First floor consists of a Great Room with beams, real pine paneling, wood stove hearth, and wall to wall windows overlooking the lake . Watch the sun rise over the eastern hills. The Great Room is open to a remodeled kitchen and also a sun room which turns into a porch in the summer. Also on the first floor is the master bedroom with 2 walk in closets. A full bath opens to the master bedroom and also a front hall. Upstairs is a very large bedroom which, because of the way it sits, could easily be turned into 2 bedrooms. The upstairs is also plumbed for a bathroom. Listed by Coldwell Banker. From this location you can be skiing at Gunstock, Waterville,Ragged or Loon in less than 40 min. Winnisquam, Squam , Winnipesaukee and Newfound Lake are also a short trip by car or snowmobile. In the summer in addition to the great rainbow trout fishing you can water-ski or tube. For additional information on this home call Lady of the Lake Realty at 1-888-737-5550 or e-mail at info@nhlakesrealty.com or visit our website to view similar lake homes in New Hampshire at www.nhlakesrealty.com or www.lakeorskirealestate.com Contact us today to see if this home is still available? ?